Creativity is alive and well at Samsung, which is developing several cool devices in its labs, including a home companion robot called Otto. The multi-talented robot can answer questions and double as a part-time security system when needed. It is expected to be demonstrated at the Samsung Developer Conference this week in San Francisco. Functionally, Otto is similar in some ways to Amazon Echo, featuring an interactive speaker that can answer questions, order products and play music. But the robot also includes a "head" that hosts a high-definition camera and a display. You can ask questions like "What is Hillary Clinton's age?" or seek out news or weather information, and Otto will bark out the answers. The robot is a prototype, and Samsung has no plans to sell the device. Otto's camera is especially handy for home security. The robot can broadcast live images from its integrated camera to PCs or mobile devices. Its head and camera can move with the help of servos and motors, and the head can be directed to moved up, down, left or right through a mobile app. Like Amazon Echo, Otto can also work with smart appliances in a home. You can tell the robot to power up a smart appliance like a home air-conditioning system. The robot is one of many prototype products being developed by a special unit at Samsung. It is based on the company's Artik development board, a Raspberry Pi-like computer that can be used with wearables, robots, gadgets, and other products. There are many possibilities with a device like Otto, and the goal is to spur new product ideas from customers, said Curtis Sasaki, vice president of ecosystems at Samsung. 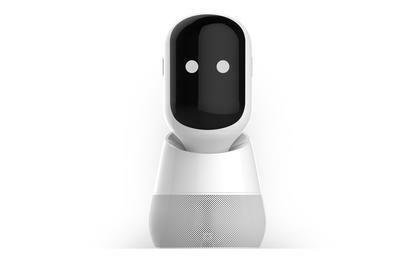 For one, the robot offers an opportunity to test technologies like image and face recognition in home environments, Sasaki said. "This is a different way of giving an idea of where IoT (Internet of Things) can go," Sasaki said. At the developer conference, Samsung will also show a reference design of a security system designed to differentiate between animals and humans using algorithms. Adding artificial intelligence could make security systems more effective and reduce the chances of alarms going off because of false positives. Samsung has big plans for home automation. Starting next year, the company is equipping homes with Internet-connected appliances like refrigerators, ovens, washing machines, and light bulbs. At CES this year, Samsung showed a smart refrigerator that could identify missing items, compose a grocery list, and send it to the owner. Samsung's Artik boards are the starting point for such gadgets, and the company is also tapping into the DIY enthusiast community to come up with new ideas. It's hard to predict where the next big IoT hit emerges from, but Samsung wants its technology to be in the product. Samsung is also building cloud services to improve the functionality of connected devices. For example, the company's Simband cloud-based health analytics service can collect health data from wearables or health monitors. The Artik boards can also be used for driver assistance systems, home automation, and cloud-based home security services.